The transformation of the Community Football Hub is now fully underway, and we are now one-step closer to our vision with the new Chrisbeon chairs now being in place at the Hub. 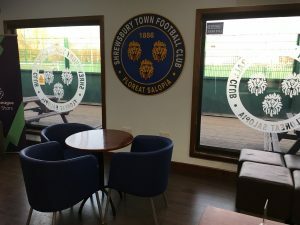 Chrisbeon first visited us a few weeks ago to recover and restore the existing built-in seating within the supporters bar. Now Chrisbeon, along with manufacturer Nomique have added 16 free-standing chairs to the hub as we continue to work to upgrade the facility. These elegant tub chairs feature a distinctively shaped profile, fully upholstered and fitted with a shaped seat pad and are now fittingly donned in the club’s blue colour. Nomique is a British designer and manufacturer of quality seating and furniture for the contract market. Nomique have been producing quality furniture in their manufacturing facilities based in Telford, since 2002. MD of Nomique Seating, John Ravenhall, had this to say about the project. 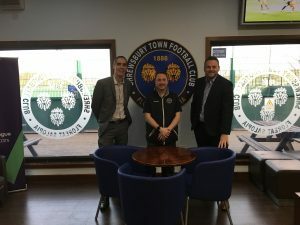 The Community Football Hub will be used to ensure that we can increase participation in physical activity, provide further opportunities for employment and volunteering and further develop links with local schools and grassroots clubs. For more information about the new hub and what is on offer head here.